Vince Young is out for the season and needs to do some soul-searching. 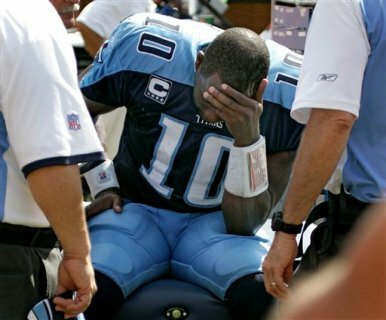 The latest incident in the saga of Vince Young and the Tennessee Titans has had me scratching my head the last couple of days. In an interview with ESPN’s Adam Schefter, Young admitted that he threw his shoulder pads into the stands in frustration while giving his jersey to the daughter of a team executive. Viewing this situation, I can see fault in the positions of both Fisher and Young because I think both of them have helped this situation become a hot mess. Meanwhile, Titans owner Bud Adams has told both of them to figure out a way to work things out. Despite the fact that Young is 30-17 as a starting quarterback, Fisher has never had confidence in him. According to various reports, Fisher didn’t really want to draft Young; his preference was his Rose Bowl opponent, USC quarterback Matt Leinert. According to ESPN analyst Trent Dilfer, Fisher and the coaching staff have had to “dummy” down the offense to fit what Young can do. When the Titans struggled to an 0-6 start last season with Kerry Collins, it took the urging of team owner Bud Adams for Fisher to put Young back in the starting lineup. With Young under center, the Titans went 8-2 down the stretch and probably saved Fisher’s job. In a loss to the Pittsburgh Steelers, Young threw a couple of interceptions early and got pulled from the game. When the Titans lost to the Miami Dolphins, Young was apparently frustrated that Fisher didn’t start him and when he got hurt in Sunday’s loss to Washington, he was upset that his head coach didn’t stick with him. What’s odd about all this is that Young has actually improved as a quarterback with 10 touchdown passes, three interceptions and a quarterback rating of 98. At one point this season, he was the league’s top rated passer. But while I can understand Young’s frustration with having a coach that doesn’t trust him to do his job, running out on his team is definitely not the answer. In fact, it’s the ultimate act of immaturity and gives Fisher all the ammunition he needs to keep him on the Titans’ bench. Throughout his time in the pros, Young has done things that make you think that he should have a pacifier instead of a mouthpiece in his helmet. From refusing to go into a game after fans booed him to getting into an altercation with a fan who made fun of the University of Texas with a reverse Hook ’em Horns sign, he’s done the kinds of things that could make you question his ability to lead. If Young wants to prove that he belongs in the NFL, he needs to grow up, toughen up, and stop pulling punk moves like these. Perhaps Young should make a phone call to the opposing quarterback in last Sunday’s game—Donovan McNabb, a guy who has had more than his share of slings and arrows flung at him over the years. He can tell VY a thing or two about how to handle to adversity like a professional. Young could also give a shout out to Eagles quarterback Michael Vick as well. When McNabb was wrongfully benched in the last two minutes of a Redskins loss to the Detroit, he didn’t bail out on his team or even criticize his coach, although in that situation he may have had every right to. But McNabb conducted himself as a professional and worked through it. Even when fans and the Philadelphia media branded him as thin skinned when Eagles fans (and talk radio pontificators) became too hard to ignore, McNabb remained focused as a player. Ironically, it was Young who criticized McNabb back in 2007 for pointing out that Black quarterbacks get more criticism than their white counterparts. In Jason Campbell’s tenure with the Redskins he endured poor coaching and more than a few offensive coordinators. With his new team, the Oakland Raiders, he was benched in week two. Yet, Campbell has managed to maintain his professionalism and his work ethic while winning back his starting job. It may be too late to convince Fisher and the Titans coaching staff that you’re their guy. If the trust that a quarterback and a coach need for things to work isn’t there and isn’t possible between Fisher and Young, it might be in Adams’ best interest to trade his former first-round pick to another team. A change of scenery and a new coach may be all that’s needed to help Young refine his skills and let him become the quarterback he’s capable of becoming. But while Black quarterbacks are still more highly scrutinized and have less of a margin for error than their white counterparts (paging Brett Favre), Young doesn’t help himself by conducting himself in a way that doesn’t recognize this reality. Whether you’re the CEO of American Express or the President of the United States, if you’re Black and in a position of authority like, say, an NFL quarterback, you don’t have the luxury of crying about it. You have to keep your head up and keep keeping on. Hopefully the next group of Black quarterbacks like Auburn’s Cam Newton and Ohio State’s Terrell Pryor will see how Young has conducted himself during this latest incident——and do the exact opposite. It’s eight weeks into the NFL season and former Eagles and current Washington Redskins quarterback Donovan McNabb is once again dominating the headlines in the Philly sports market. In the latest episode of that long-running Sunday series, “As the McNabb Turns,” Redskins’ head coach Mike Shanahan benched the former Birds quarterback for Rex Grossman in the last minute of last week’s 37-25 loss to the Detroit Lions. And true to Grossman form, he fumbled the ball and it was picked up Ndamukong Suh for a score and well, you know the rest of the story. The news of McNabb’s benching was discussed on all the local talk shows in Philadelphia. His detractors came out of the wood work from South Philly to South Jersey and all points around the city to delight in McNabb’s apparent misery. For those who despised McNabb during his tenure in Philly, it was a bizarre kind of sweet vindication, if you want to call it that. It was “I-told-you-McNabb was soft.” One of my homies who lives in North Philly is chomping at the bit to tell me how he told me so about McNabb’s supposed lack of manhood. I know he has been waiting all week to tell me a thing or two. One of the biggest knocks against McNabb was that he could not run the two-minute drill and doesn’t come through in the clutch (apparently no one remembers 4th and 26th against Green Bay in the 2003 playoffs ). In the minds of McNabb naysayers, this is the guy who reportedly threw up at the Super Bowl and moved the Eagles’ hurry up offense at horse and buggy pace late in that game. And then you have the comments of former Birds receiver and McNabb nemesis Terrell Owens on the T.Ocho Cinco Show. Without coming out and saying it, he suggested that he knew a thing or two about McNabb’s apparent fatigue at the end of Super Bowl XXXIX. Even former Eagle wide receiver Freddie Mitchell weighed in, telling myfoxPhilly.com that he respected Shanahan for pulling McNabb. He also believes McNabb had him blackballed from the league. McNabb’s performance so far in Washington hasn’t exactly set the world on fire. He is the 25th rated passer in the NFL. He has completed less than 60 percent of his passes and has thrown more interceptions than touchdowns. In his defense, he has been battling through some leg injuries. Against the Lions, McNabb was 17-of-30 for 210 yard with one touchdown and one interception. All that said, you don’t bench your starting quarterback with a minute to go, especially not with Grossman. Really? C’mon, man. Shanahan really knows how to inspire a confidence in his team by putting in a loser like Grossman. Just as strange as McNabb’s benching was the different answers that Shanahan gave for his reasons for sitting McNabb while the team still had a chance to win. It reminded me of the police interrogation scene in the movie, “Menace II Society.” In that scene, Bill Duke plays a steely, no-nonsense detective who is questioning young Caine Lawson (played by Tyrin Turner) who keeps changing his story about his involvement in the murder of a convenience store owner. I kept thinking what it would be like if Bill Duke in his role as the detective in Menace II Society was at all the press conferences in which Shanahan came up with different reasons for benching McNabb. Bill Duke: You pulled your starting quarterback because he didn’t know the terminology? Actually, Shanahan topped that tomfoolery by bringing in No. 1 Draft bust JaMarcus Russell, a man who was not necessarily known for being a student of the game for a workout with the team. Kyle Shanahan, Mike’s son and offensive coordinator, supposedly told McNabb he might be pulled, something McNabb denies. The former Syracuse star, to his credit, refused to criticize Shanahan for pulling him. For McNabb, all of this drama is nothing more than a surreal re-run of his time in Philly from Rush Limbaugh to T.O. and being benched in Baltimore in 2008. The one thing I give McNabb is that he has a tendency to shut up his critics on the field. One game after being benched in Baltimore, McNabb led the Eagles to a win over the Cardinals and a playoff run that led the Birds to the NFC title game. The next game on the Skins schedule: The Philadelphia Eagles on Monday Night Football.